It's deja vu all over again, as developers who successfully weakened adequate public facilities standards in Rockville only three years ago return for yet another bite at the apple. This time, there is a mysterious pressure to further reduce adequate public facilities standards to allow more development near the Rockville and Twinbrook Metro stations. The Mayor and Council have scheduled a discussion on the topic for their December 17, 2018 meeting, which begins at 7:00 PM. Will the standards be weakened again? That answer could turn on whether or not a public hearing and vote on the matter can be taken before January 8, the day that Councilmember Julie Palakovich Carr is expected to resign from the City Council to take office as a state delegate from District 17. A process to replace Palakovich Carr will be discussed at the Mayor & Council's December 10 meeting. 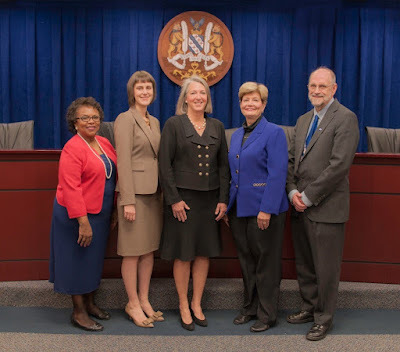 Palakovich Carr would provide the deciding third vote to weaken the standards; once she is off the Council, the pro-development Team Rockville faction would no longer be assured of a 3-vote majority. The new councilmember would be the deciding vote, and we don't know the position of that yet-unknown person on APFS matters. Any change would be a contentious one - a majority of citizens opposed the 2015 change to align Rockville's school capacity standards with Montgomery County's. That opposition never weakened; the issue was only decided in favor of the developers because Team Rockville held a 3-vote majority on the Council. If any proposed change fails to pass by early 2019, it could become the key issue in next year's City elections. One of the problems in arguing for the change is that proponents promised the 2015 change that allowed several developers to move projects forward would solve school overcrowding in Rockville. With a development moratorium looming as soon as 2020, that was clearly proven to be a false promise. "A majority of citizens opposed the 2015 change to align Rockville's school capacity standards with Montgomery County's." They did? Was there a referendum that I missed? 7:25: Yes - the public hearings on the topic, where resident opponents massively outnumbered resident supporters. Well, if that's what you meant, then you should have written, "A majority of citizens who attended previous public hearings on the topic opposed the 2015 change to align Rockville's school capacity standards with Montgomery County's." Because "a majority of citizens of Rockville" would be 30,605 people. 1:13: And all 30,605 citizens had the opportunity to speak at the public hearings. A majority opposed the change. In a participatory republic, there's no such thing as a "silent majority," despite yours and Dan Reed's best efforts. How is it you are so anti development and opposed to over crowding our schools yet continually call Montgomery County "moribund" and are in favor of companies like Amazon coming to our County. You can't have a huge employers like Amazon come here without adding to the schools enrollments and building more developments. Seems to me you are auguring both sides of the coin. 8:33: Amazon was a very unusual case. 99% of corporate HQs don't have 25000-50000 workers. So I am correct that we should focus on attracting these HQs, because they do not generate the costs and services that residential developments do. You're admitting VA is more business-friendly, and they got Amazon. How does your comment make the MoCo cartel sound good again? Or maybe you were being sarcastic, and I am just misunderstanding? Because your comment mostly acknowledges the advantages of Virginia. You are right and wrong. I agree with you on the state of MoCo and that Virginia is light years ahead from an economic development standpoint. I am disagreeing with your premise that you can attract an Amazon or major employer without housing. People and therefore housing are the lifeblood of economic development. There is a major shortage of workers in our region, thus the low unemployment figure. Talent is the most expensive component for any major employer. Create the environment and housing supply for them to effectively recruit talent and they will come. Continue to say no to housing, mixed-use development, and have a horrible tax structure and keep asking companies to come to MoCo instead of Virginia and you are going to continue to get the same result. You can throw every incentive you want at a company but if you don't have a viable workforce pipeline and the type of environment that allows them to retain and attract that workforce and they will never come.